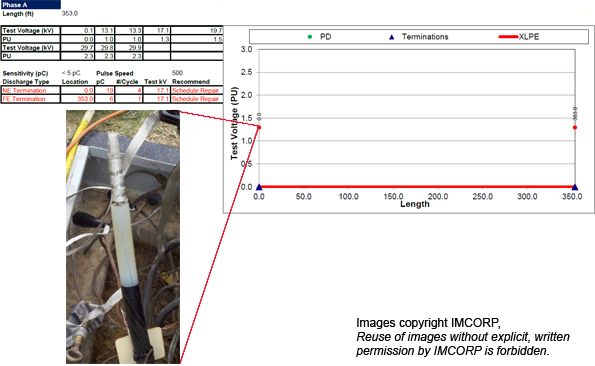 While performing a Factory Grade® assessment for a utility client, IMCORP detected sub-standard partial discharge (PD) activity in URD cable elbow termination. After the assist crew cleaned and applied dielectric grease to the elbow bushing interface, the cable was reassessed but the PD performance unchanged. The crew then removed the elbow, examined the cable preparation and discovered the cause of the PD activity to be residual semiconductive (semicon) material adhering to the insulation. This defect was most likely caused by a workmanship error while stripping the semicon off of the cable insulation. Like many of the defects uncovered by IMCORP's Factory Grade® technology, the magnitude of signal from the PD activity at this site was very small, only 19pC. Less sensitive tests would have been unable to detect the existence of this defect, despite the fact that it would impact the long term performance of this cable system.